you with options and versatility with TV viewing in you home or business! 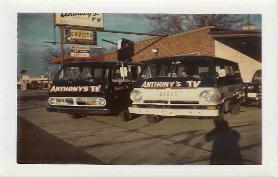 In 1955 Anthony started a TV and Radio service as well as TV antennas and Auto Radios. He worked hard to build his business and had a good Reputation is this area. In 1965 Roger Betty and family are the New owners! Ed was still employed as shop man. good. Also adding Dan our 3rd employee was important to the business ! In the 80's there are less SALES of TV's, big Dish is here creating sports bars. Dish Installations and repairs also Intercomes/doorbells for town homes and condominiums. location no more TV Service Just Installation. HD TV (Hi definition) off air antennas, and up grading for 2009 deadline. Multi room Audio/Video and networking, also Set Top Boxes give TV many new options! 2008 Less than a year for over the air analog TV! home and add jacks for Antennas cable satellite telephone speakers etc.